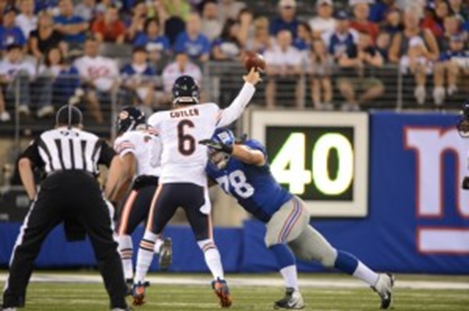 Markus Kuhn rushes Chicago Bears quarterback Jay Cutler. New York Giants defensive lineman Markus Kuhn says that whenever he sees former Giants great Michael Strahan, the two joke about a link from their geographical pasts. “I kid him that Germany produces great linemen for the New York Giants,” Kuhn says, laughing. Strahan lived in Germany as a child, the son of a U.S. Army man. But Kuhn, who played football for the Wolfpack from 2007-2011, hails from Weinheim, Germany and, he says, is only the third German player ever to reach the league. Sporting life in Weinheim pretty much meant that Kuhn could find an athletic outlet in soccer, Germany’s most popular sport. (He says football in Germany is less popular than soccer is in the United States). But it wasn’t until he was 14 years old and vacationed in Florida that Kuhn found his true calling. He remembers seeing a football game on television and thinking it was cool that there were these large guys hitting each other at full force. “I thought it fit my personality,” he says. So Kuhn returned to Germany and started playing linebacker and defensive end for a club team, the Weinheim Longhorns, when he was 15. He played for four seasons, racking up tackles and multiple all-star honors. It was then that he decided to bring his game to America. Kuhn and his father traveled to smaller programs like Liberty University and to larger programs like NC State, armed with his translated transcripts and a highlight DVD in hand. He immediately fell in love with the Wolfpack. “The school was one of the friendliest and most open,” he says. 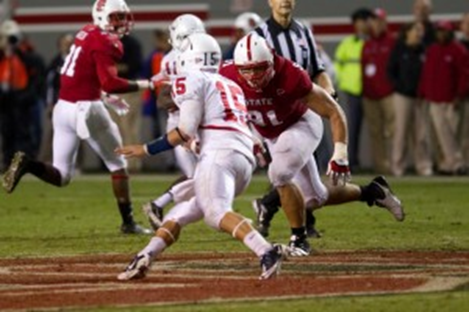 Kuhn was taken in the seventh round of last April’s NFL draft by the Giants, who already had former Wolfpackers Sean Locklear and Andre Brown on their roster. Kuhn, 26, has played in every game and continues to learn something new, like different blocking schemes from offensive lineman, with every snap. And he talks about his learning curve and his success with an appreciation for the somewhat absurd way his story has unfolded. “It’s a pretty unusual story and sometimes I can’t believe where I am right now,” he says. “For an American kid playing in high school, it’s very unrealistic. If you’re a German kid playing in Germany, it just doesn’t happen.